Ishibutai Kofun (石舞台古墳) is the largest stone grave of Japan located in Asuka, Nara Prefecture. It was constructed in early 7th century. It is the stone chamber of mausoleum of Soga no Umako. There are about 30 stones constructed for this chamber and entire weight is about 2,300 ton. The roof is about 77 ton. This chamber was covered with the earth. However, the earth had lost. The inside of the chamber is 7.7m long x 3.5m wide x 4.7m tall. It was used to be 51m square Kofun with moat. Admission: 250 yen for adults, 200 yen for high school, 150 yen for junior high, 100 yen for elementary school. There is a group discount. 1. use Kintetsu Line to Asuka. 2. use local bus to Ishibutai. Ishibutai Kofun was constructed in the late of Kofun period (early 7th century). Ishibutai literary means stone stage because it looks like huge stone stage. It was covered with earth, but the earth was lost and the stone chamber was appears. The historian considers this Kofun of Soga no Umako. Soga no Umako was one of the powerful family in early Japanese empire. 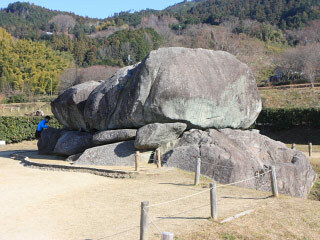 It is the largest Stone Grave in Japan. The entire weight of Kofun is 2,300t. The inside of the chamber is 7.7m long x 3.5m wide x 4.7m tall. It was used to be 51m square Kofun with moat.